School starts soon, which brings up the question of hot lunch or packed lunch. Until the USDA and school system get on board with healthy, less wasteful school lunches, your best bet is to send a packed lunch to school. From meals full of saturated fat and sugar to packaging overload to chemicals and pesticides - school lunches leave much to be desired. A delicious packed lunch doesn't take much time to make, plus nowadays there are tons of awesome lunch boxes to choose from. 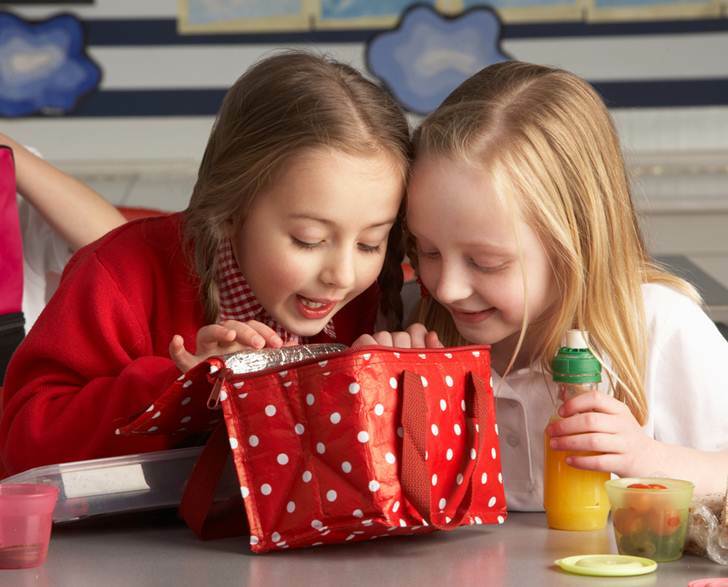 Keep reading to see the best reasons why you should send a packed lunch to school with your child. First consider the fact that public schools consider french fries and pizza a decent serving of veggies. Next consider that kids were served pink slime meat for years and years before anyone saw fit to do something about it. Lastly consider that it took 15 years just to enact some extremely simple healthy lunch changes at schools. Anyway you slice it, public schools care very little about what your child is eating. There have been some minor positive changes recently, such as more farm-to-school lunch programs, but overall, in most schools in the country, school lunches are the last thing you want your child eating. According to one California Watch analysis, a full 60% of CA school lunches reviewed over the last five years failed to meet federal nutritional requirements. California Watch notes that 30% of CA school districts exceeded the saturated fat limit and four out of five districts exceeded healthy sodium levels. What’s worse is that California is actually considered “a leader in the nation” when it comes to better school lunches, so good luck if you live elsewhere. In fact, a 2007 study commissioned by the U.S. Department of Agriculture (pdf), shows that just 7% of schools nationwide meet school lunch nutritional requirements. On top of this, although school policy now says school lunches must be healthier, if kids reject healthy fare, after just a few attempts at serving healthy food, schools simply give up and go back to serving burgers and tater tots. In a country with skyrocketing obesity and childhood diabetes rates, this is 100% unacceptable. You can do better with healthy homemade lunches. + How does your child’s lunch stack up? Most schools in this country don’t serve organic or GMO-free fare. Unless you’re extremely lucky, your child attends a school where the lunches are packed with GMOs, pesticides, artificial and toxic ingredients and fake food colors. Schools claim they can’t afford healthy, toxic-free food, but groups like Revolution Foods and advocates like Jamie Oliver have shown it’s 100% possible to feed kids well on a budget. In fact, some advocates, like Chef Ann Cooper; aka Renegade Lunch Lady, says schools can serve up healthy meals for just $1 a pop. Schools simply won’t get on board or admit that they’re wasting cash on insane extras like too much administration, crazy stuff like Fizzy Fruit (why yes, this is carbonated fruit) and energy misuse. According to the U.S. Department of Energy, schools spend more than $6 billion a year (pdf) on energy use and with just some simple changes, at least $1.5 billion of this could be saved and used for healthier food – $1.5 billion is a ton of organic apples. If schools set proper budgets they could afford healthy food for kids. But, since they won’t, you’re better off sending a packed lunch. 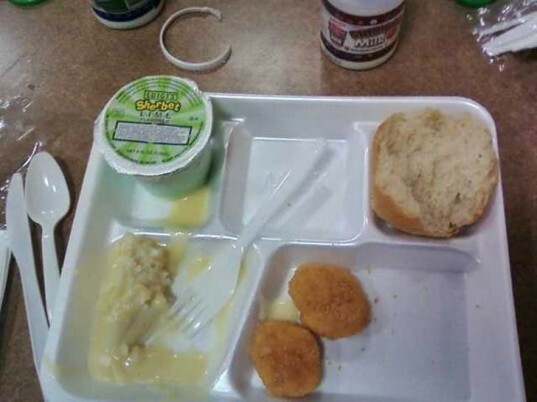 Trays, plastic silverware and other food packaging is a major issue in schools. Most schools use disposable everything nowadays from toss-away trays to paper napkins to plastic utensils to milk containers to food that comes pre-wrapped. All-in-all, the typical American school kid generates 67 pounds of discarded lunch packaging waste per year, or a whopping 18,000 pounds per school annually. Food waste is also a huge issue. A past Sustainable Agriculture Newsletter from the University of Minnesota noted that, “The food waste produced in the United States each day would fill the Rose Bowl stadium to the top.” Wasted food in schools contributes to this issue. Although it’s tough to measure how much school food is being wastesd, after one middle school in Connecticut set up a compost program (pdf) they found that kitchen prep scraps equaled around 17– 20 pounds of waste per day and plate scrapings came up to about 28 pound per day. Keep in mind that this school has just 650 students, so that’s 48 pounds of food wasted per day, for a school with under 1,000 kids. 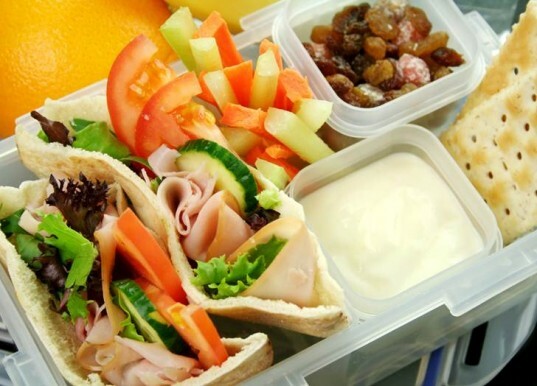 If you pack your child a lunch you can cut back on waste considerably by using all-reusable goods. If you’ve got a vegetarian, vegan or gluten-free kiddo, good luck getting a school to provide a healthy school lunch. For example, one mom, after visiting her child’s school for lunch, pointed out that the vegetarian choice of the day was cheese-filled bread sticks (great). Other veggie choices, according to my local PDX school lunch menu (pdf), include starchy baked potatoes, grilled cheese, chili topped with cheese and mac n cheese. In fact every single vegetarian offering is cheese-heavy, meaning vegan kids are out of the equation. I’ve talked to many parents at private schools who note their vegetarian kid doesn’t fare much better, with few choices other than salad or beans. Gluten-free meals just aren’t gonna happen, period, unless your child attends a very unique school. Some schools have actually embraced ideas like Meatless Monday, but since the USDA has shunned Meatless Monday recently, who knows if public schools will continue to serve Meatless Monday fare. As for beverages, most schools serve cow’s milk – often flavored. The USDA says soy milk can be reimbursed by the National School Lunch program. However, to get soy milk on the menu, parents have to go through the trouble of sending a “medical or cultural need” letter to the school. In general, if your child is a non-meat eater or has food allergies of some sort, school lunches just don’t cut it. Honestly, public school lunches can be pretty inexpensive. Especially if you get reduced or free school lunches. Packed lunches, in my experience, especially if you go organic, DO cost a bit more up front than school lunches. Some parents don’t like this. In fact, the main argument I hear from parents about healthy food in general is, “I would feed my kid healthy – but it’s too expensive.” Honestly, when I hear people say, “Healthy food costs too much” all I think is “Wow, what complete and utter nonsense.” Calorie for calorie, junk food is less costly than healthy fare, but still, in a country where the average home has 3 television sets, people shell out $100+ for cable each month and more than 90% of kids own expensive cell phones, I don’t want to hear it. Not all, but many people could afford healthier food by giving up some “want” items. Plus, healthy food is 100% worth the cost. Take a look at these figures below. Diabetes and pre-diabetes cases have skyrocketed among kids due to increasingly poor diets and too little exercise. A recent CDC study found that annual medical expenses for youth with diabetes are $9,061 compared to just $1,468 for youth without the disease. Lower junk food costs are directly related to higher weight gain in kids. Meaning, parents buy the lower cost junk vs. good food, but at what cost? Childhood obesity has more than tripled in the past 30 years and the CDC notes that 12.5 million adolescents aged 2—19 years are obese (this isn’t counting overweight kids). Unhealthy weight gain due to poor diet and lack of exercise, in turn causes 300,000 deaths annually. But death is cheap, the real money is spent on complications like heart disease, depression, bone and joint problems, elevated blood pressure, respiratory difficulties, chronic musculoskeletal problems, skin problems, infertility later in life, certain types of cancers, gallbladder disease, liver disease and other weight-related issues to the tune of $100 billion+ a year in the USA. And kids are far from immune. In the long run, it costs less to feed your kids a healthy diet than it does to treat medial problems. Although price per calorie for junk food is cheaper than healthy food, healthy food is a better deal when you compare price per nutrients and portions. First consider the fact that public schools consider french fries and pizza a decent serving of veggies. Next consider that kids were served pink slime meat for years and years before anyone saw fit to do something about it. Lastly consider that it took 15 years just to enact some extremely simple healthy lunch changes at schools. Anyway you slice it, public schools care very little about what your child is eating. There have been some minor positive changes recently, such as more farm-to-school lunch programs, but overall, in most schools in the country, school lunches are the last thing you want your child eating. According to one California Watch analysis, a full 60% of CA school lunches reviewed over the last five years failed to meet federal nutritional requirements. California Watch notes that 30% of CA school districts exceeded the saturated fat limit and four out of five districts exceeded healthy sodium levels. What's worse is that California is actually considered "a leader in the nation" when it comes to better school lunches, so good luck if you live elsewhere. In fact, a 2007 study commissioned by the U.S. Department of Agriculture (pdf), shows that just 7% of schools nationwide meet school lunch nutritional requirements. On top of this, although school policy now says school lunches must be healthier, if kids reject healthy fare, after just a few attempts at serving healthy food, schools simply give up and go back to serving burgers and tots. In a country with skyrocketing obesity and childhood diabetes rates, this is 100% unacceptable. You can do better with healthy homemade lunches. + How does your child's lunch stack up? 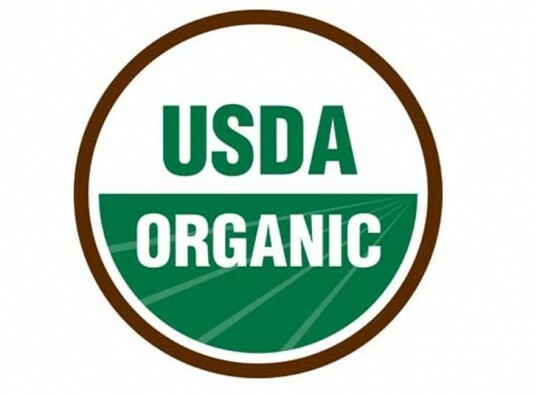 Most schools in this country don't serve organic or GMO-free fare. Unless you're extremely lucky, your child attends a school where the lunches are packed with GMOs, pesticides, artificial and toxic ingredients and fake food colors. Schools claim they can't afford healthy, toxic-free food, but groups like Revolution Foods and advocates like Jamie Oliver have shown it's 100% possible to feed kids well on a budget. In fact, some advocates, like Chef Ann Cooper; aka Renegade Lunch Lady, says schools can serve up healthy meals for just $1 a pop. Schools simply won't get on board or admit that they're wasting cash on insane extras like too much administration, crazy stuff like Fizzy Fruit (why yes, this is carbonated fruit) and energy misuse. According to the U.S. Department of Energy, schools spend more than $6 billion a year (pdf) on energy use and with just some simple changes, at least $1.5 billion of this could be saved and used for healthier food - $1.5 billion is a ton of organic apples. If schools set proper budgets they could afford healthy food for kids. But, since they won't, you're better off sending a packed lunch. Trays, plastic silverware and other food packaging is a major issue in schools. Most schools use disposable everything nowadays from toss-away trays to paper napkins to plastic utensils to milk containers to food that comes pre-wrapped. All-in-all, the typical American school kid generates 67 pounds of discarded lunch packaging waste per year, or a whopping 18,000 pounds per school annually. Food waste is also a huge issue. A past Sustainable Agriculture Newsletter from the University of Minnesota noted that, “The food waste produced in the United States each day would fill the Rose Bowl stadium to the top.” Wasted food in schools contribute to this issue. Although it's tough to measure how much school food is being wastesd, after one middle school in Connecticut set up a compost program (pdf) they found that kitchen prep scraps equaled around 17– 20 pounds of waste per day and plate scrapings came up to about 28 pound per day. Keep in mind that this school has just 650 students, so that's 48 pounds of food wasted per day, for a school with under 1,000 kids. 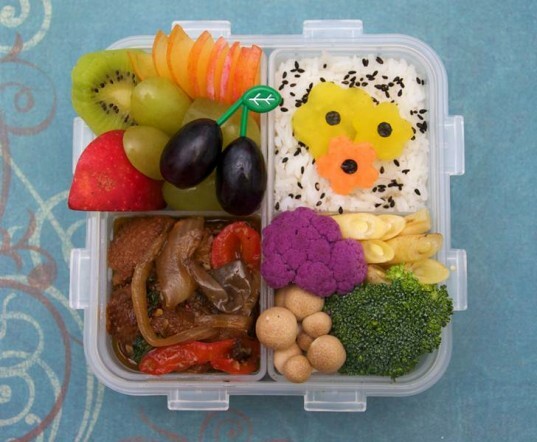 If you pack your child a lunch you can cut back on waste considerably by using all-reusable goods. If you've got a vegetarian, vegan or gluten-free kiddo, good luck getting a school to provide a healthy school lunch. For example, one mom, after visiting her child's school for lunch, pointed out that the vegetarian choice of the day was cheese-filled bread sticks (great). Other veggie choices, according to my local PDX school lunch menu (pdf), include starchy baked potatoes, grilled cheese, chili topped with cheese and mac n cheese. In fact every single vegetarian offering is cheese-heavy, meaning vegan kids are out of the equation. I've talked to many parents at private schools who note their vegetarian kid doesn't fare much better, with few choices other than salad or beans. Gluten-free meals just aren't gonna happen, period, unless your child attends a very unique school. Some schools have actually embraced ideas like Meatless Monday, but since the USDA has shunned Meatless Monday recently, who knows if public schools will continue to serve Meatless Monday fare. As for beverages, most schools serve cow's milk - often flavored. The USDA says soy milk can be reimbursed by the National School Lunch program. However, to get soy milk on the menu, parents have to go through the trouble of sending a "medical or cultural need" letter to the school. In general, if your child is a non-meat eater or has food allergies of some sort, school lunches just don't cut it.